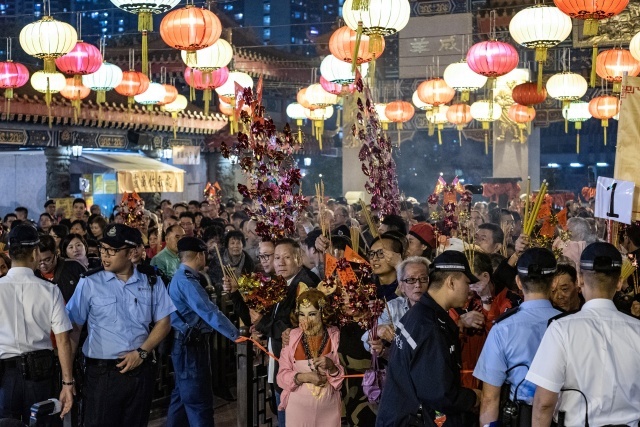 (AFP) - Chinese communities around the world welcomed the Year of the Pig on Tuesday, ushering in the Lunar New Year with prayers, family feasts and shopping sprees. During the Spring Festival season -- a 40-day period known as "Chunyun" -- China's masses will be on the move, chalking up some three billion journeys, Chinese state media reported. In Hong Kong, flower markets were filled with residents picking out orchids, mandarins and peach blossoms to decorate their homes -- with stalls also boasting a dizzying array of pig-themed pillows, tote bags and stuffed toys. Across the border, crowds also packed the Longhua temple in Shanghai to pray for good fortune. In Japan, the capital's famous Tokyo Tower was due to turn red in celebration of the New Year -- a first for the city. Relations between Taipei and Beijing have had a rocky start to 2019 after Xi Jinping delivered a bellicose speech last month describing the island's unification with the mainland as "inevitable".